Serbian tennis star Ana Ivanovic announced her retirement at the end of the 2016 season. Ana shined on the tennis court with her beautiful playing style and infectious smile. 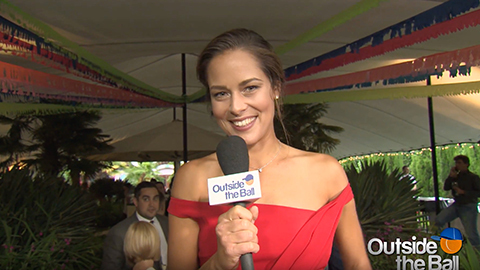 Over the years, Ana has joined Outside the Ball for playful interviews showcasing the player’s personality and in this video, we compiled a collection of our favorite moments. You will want to get up and dance as the video kicks off with our original remix to “Shake it Off” by Taylor Swift. The hit parody music video was made specifically for Ivanovic and was a big hit with fans and with Ana herself. 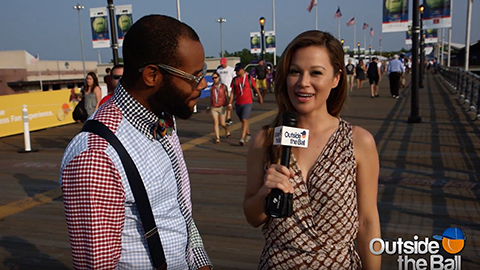 Ana reviewed the music video with host Mayleen Ramey and reminisced on the first time she watched it. “I have (watched it) actually, last time was around September time. It kind of inspired me, after that I won an event in Tokyo. “ Ivanovic even busted a move along with the music. The Serbian has passionate fans all over the world and we couldn’t resist putting fans to the ultimate test with our Ana Ivanovic Fan Challenge. Fans were eager to accept the trivia challenge and by the end, everyone was chanting “Ajde”! Ivanovic is a pro at not only looking good on the tennis court, but looking good off the court. The tennis star has attended countless player parties and special events and has mastered the art of the pose. Mayleen Ramey asked Ana to teach us how to stand on a red carpet and it’s all in the hip. But you not only want to look good, you also want to feel good. Ivanovic is an advocate for a healthy style and she spent time teaching us how to eat well while temptation is everywhere! Ana Ivanovic has shown the sport so much talent and kindness! Her presence will be missed by many. We hope you enjoyed our tribute video and we wish Ana nothing but the best in this new chapter of her life! We thank you Ana, for inspiring us and fans all over the world! Next Article Feliciano Lopez Gives His Favorite Meme FELI APPROVAL!